Nuts provide protein, fiber, fat and other nutrients. They add crunch, texture and flavor. As an ingredient they can add value to products and some panache to a foodservice item. They are also represent one of the most common food allergens, but careful labeling and segregation have allowed the use of nuts in food processing to flourish. In 2011, 2.6 million tons of nuts were grown in the U.S., up 8 percent from the year before. About $6 billion worth of nuts are sold each year, and that figure is growing, despite heightened awareness of and reaction to food allergies. 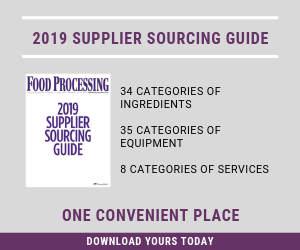 Part of the reason for that is that nuts are a nutrient-dense food, says Bobby Tankersley, senior vice president of procurement for Sanfilippo Foods, Elgin, Ill. In addition to retailing products under the Fisher brand, the company’s commercial ingredient division supplies nut-based products to other manufacturers to use as ingredients. "I think what is attracting consumers right now is the fiber and the healthy fats that are found in nuts," Tankersly says. "Nuts allow food manufacturers to provide an ingredient that consumers perceive as being healthy and as being upscale, so that a product with nuts is a higher value-added offering." Many U.S. consumers only get about half the amount of fiber they should be getting. Almonds offer up to 4g of fiber per 1-oz. serving, among the highest of all nuts and seeds. An ounce of pistachios also provides nearly 20 percent of the recommended amount of vitamin B6 and thiamin. So when the various promotion boards talk about nuts being nutrient-dense foods, they aren’t going out on a limb. While adding nutrition, texture and flavor to foods for the mainstream consumer continues to be the main attractions, more specific dietary concerns are also being met by nuts. Almond flour is now being touted as a gluten-free alternative to traditional cereal flours. "We have seen double-digit growth in almond flour with so many consumers looking to incorporate alternative gluten free flour into their diet," says Martin Pohl, managing partner with Hughson Nut Co., Hughson, Calif. "From industrial ingredient users blending it into their mixes to the home consumer adding it into their home recipes, it has been by far our greatest recent success story." Another new product is almond bran, made from 100 percent almond skin. "Health food processors incorporate almond bran into their products to add the nutritional value of almonds in a condensed form," Pohl notes. While the nutritional benefits of almonds are a big reason to use them as an ingredient in baking or savory dishes, flavor comes into play too, Pohl adds. "The consumers who are aware of the nutritional value of nuts may prefer the nuts with less fat or the one with a specific health claim," he says, "But studies have shown that taste preference is still the main reason they choose one nut over another." Speaking of taste, when developers are creating a snack or granola bar application, they look for three specific traits: sweetness, crunch and chew, according to research from the Almond Board of California. "To get the best results in all these areas, it is common to count on sugars to caramelize and bind ingredients in a bar formula. However, by combining almond butter and almond meal in [for an example] these Almond Granola Bars, developers are able to naturally create adhesion with nearly half the sugar used in traditional bar formulations." European consumers say almonds are the nut they eat most often in other foods. North American consumers report that of their monthly almond purchases, 38 percent of those are of almonds as an ingredient in other foods (e.g., granola bars, cereal, etc.). In North America, almond product dollar sales for granola and cereal bars make up 35 percent share of the total category and 36 percent share of the total category in energy bars. Pistachios are also prized for lending sweet exotic flavor to staples like ice cream and pastries or to more unusual, savory dishes like pistachio-crusted pork scaloppine. The American Pistachio Growers Assn. also notes that a study published in the January issue of Nutrition quantifies the amounts of polyphenols (catechins), carotenoids (beta-carotene, lutein and zeaxanthin) and gamma-tocopherol (vitamin E) offered by pistachios. These antioxidants can help attack free radicals and lower the chances of heart disease. The study was conducted by the Institute of Food Research (IFR) in the UK in association with the University of Messina, Italy. Giuseppina Mandalari, research scientist at IFR, was the lead investigator. The work was funded by the pistachio growers. "These results are the first to show the bioactive compounds are released during digestion and are available to be taken up by the body." Mandalari said. "These nutrients contribute to the beneficial relationship between pistachio consumption and healthy outcomes, such as heart disease." Pecans might be best known for the signature pie, but the American Pecan Shellers Assn. points out these nuts, too, have some great attributes, including unsaturated fats and satiety benefits. The association’s website also offers menus that might give formulators some new product ideas, such as goat cheese, pecan and apple pizza.